Accommodation, Permits... What You Need To Know! 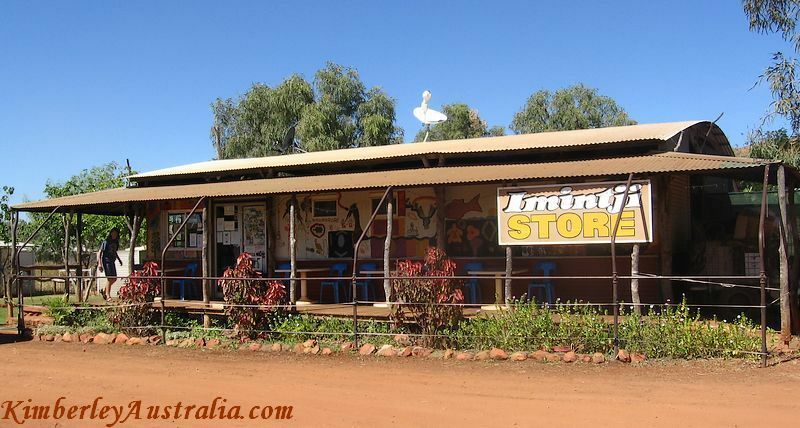 The Gibb River Road has become so popular in recent years, it is rather busy these days. In the past you would have been entirely on your own if something went wrong. If something goes wrong today, it's only a matter of minutes until another car comes along. Fuel and supplies are available at several points along the Gibb, and so are tyre and mechanical repairs. But even if the idea of your vehicle breaking down on the Gibb River Road is not as scary as it used to be, it's still a major inconvenience. And a rather costly one as well. There have been seven deaths on the Gibb River Road since 1993. And every year travellers do get themselves into trouble because their inexperience is combined with lack of knowledge and lack of preparation. Don't ruin your holidays through a road crash! Let's make sure your trip will be smooth and just wonderful all the way. Here is what you should know about the Gibb River Road and about the hazards that you might encounter on your drive. 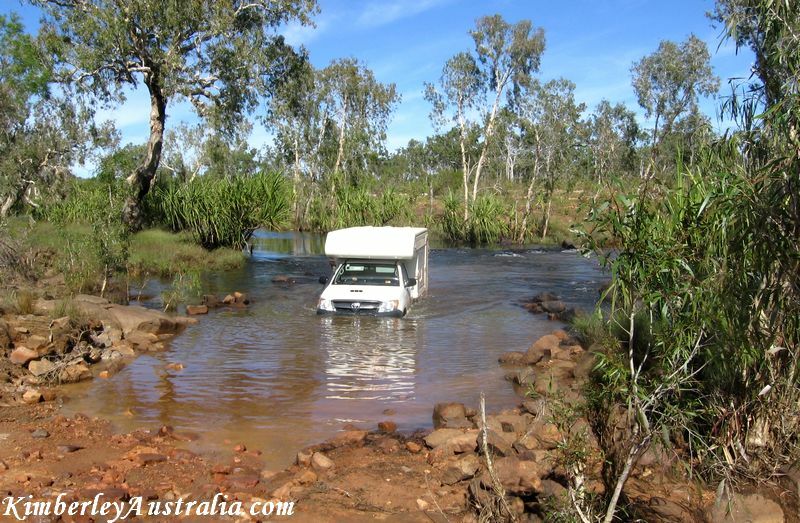 Hired campervan crossing a creek on a Gibb River Road trip. You don't need a permit to travel on the Gibb River Road or the Kalumburu Road. However, since 2018 you do need a permit to access the Mitchell Plateau. You also do need a permit if you want to enter the Kalumburu Aboriginal community. Any other travel on tracks across Aboriginal land (e.g. Carson River Track) requires a permit. If it is not Aboriginal land, then it is private. All the land either side of the Gibb River Road and other roads in the area is private land! If you want to go off exploring on any tracks other than the usual gorge access tracks please get permission from the owners. In addition to the mentioned permits there are several private properties that charge for access, requiring you to purchase some wilderness parks pass or other. Make sure your vehicle is mechanically sound and have it checked over and serviced before you leave.. If you have no four wheel drive (4WD) experience or are driving a hired car make sure you familiarise yourself with your vehicle, especially if you are travelling early in the season (April/May). Know the limitations of the car (how much water it can handle) and know how to engage the four wheel drive. 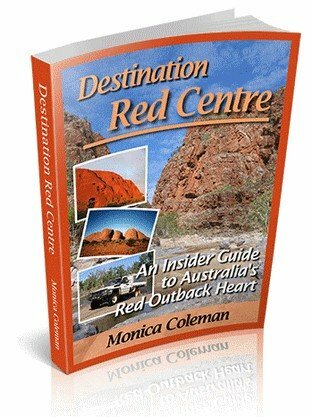 I have been contacted by people asking if it is possible to drive the Gibb River Road in a conventional two wheel drive vehicle (2WD), or if they can take their caravans. Taking a caravan is not a good idea. The corrugtions will likely make it fall apart. Tough, dedicated off-road vans are ok, but make sure they really are meant for this very rough terrain. Many so called off-road vans are not! Off-road camper trailers are generally ok, but the better ones will last better. Again, not every trailer called off-road is really suitable for the Gibb River Road. Anything you are towing on this road will take a beating. How well your van or trailer survives the trip depends on the driver more than anything else. If you are towing, make sure you drop your tyre pressures and speed. Take it VERY easy. Taking a 2WD during the middle of the dry season is possible but I don't see the point. You can make it across the Gibb River Road ok, especially if you are used to driving off-road. You do run a risk of severely damaging your vehicle in one of the river or creek crossings because of your low clearance. 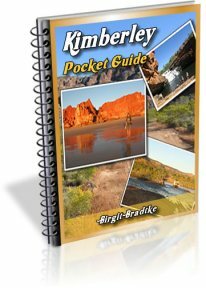 But also, all the attractions that make the Gibb River Road a worthwhile drive are on side tracks and several of those require the high clearance of four wheel drive. You will be restricted in what you can see! 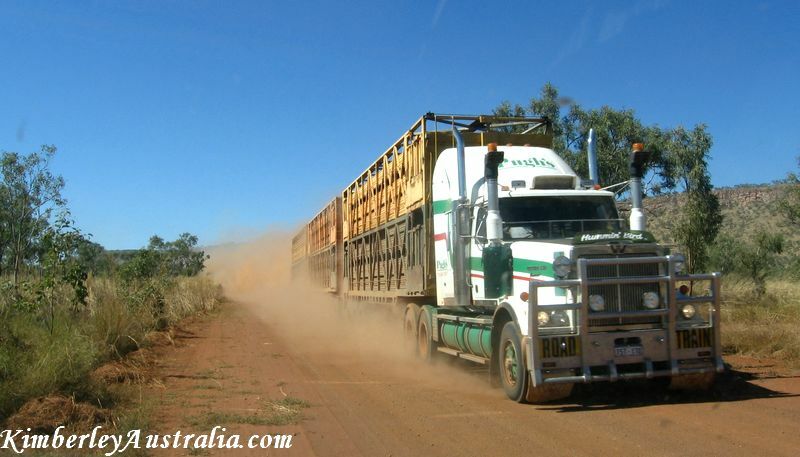 The Gibb River Road can at times be heavily corrugated, enough to rattle your teeth out. It gets graded regularly which certainly improves it, but that never lasts long. However, as long as you make sure that all you gear is stowed securely (lids on tightly etc.) the corrugations are only a nuisance. So is the dust. At the start of the season (April/May) you may encounter holes and washouts left after the wet season rains. Since all the steep sections where the Gibb River Road climbs across the ranges have been sealed this isn't really a problem any more, but do watch out on any side tracks. A steeper section of the Gibb River Road has been reinforced where it climbs out of the Pentecost River towards the Cockburn Range. The only real concern at the start of the season are creek and river crossings. Just because the Gibb River Road is open doesn't mean that your car will make it across! It comes back to knowing the limitations of your vehicle. It's so obvious I almost forgot to mention it: the Gibb River Road is of course closed during the wet season. The date it closes and reopens depends on when and how much it rains. 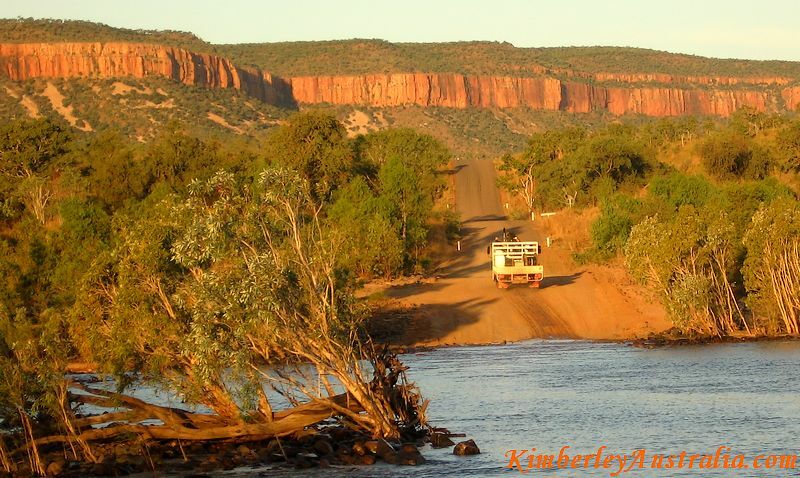 The Gibb River Road is generally open from May to November. However, early or late in the season you better double check the road conditions and water depth and be flexible with your plans. You can't drive on unsealed roads at the same speed as on a sealed road! You have to slow down! Corrugations are particularly hazardous. Flying over the top of them might feel a lot more comfortable, but think about how little traction you have when you only just touch the top of those bumps. Especially around bends it is very easy to lose control. So take it easy. Dust is always a problem on the Gibb, but don't let it tempt you into overtaking a slower vehicle unless you can actually see the road ahead. You should also drive with your headlights on so the vehicle you are approaching and any oncoming traffic have a chance to see you. If you do overtake anybody put some space between them and you before you move back to your side of the road and shower their windscreen with gravel. Whatever you do, keep in mind that the drivers of these road trains can't just jump on the brakes and stop in a hurry, so stay out of their way. Don't take any risks trying to overtake them. You will need a lot of clear straight road ahead to do so, and how you are going to see that in their dust cloud I don't know. Last but not least: at dusk and dawn there is always a risk of animals on the road. Not only wildlife but also cattle are a big hazard. Keep in mind that all the land along the Gibb River Road is cattle farming country and that the road is not necessarily fenced. You should take at least two spare tyres, but I know of many people who ruined three or more. That can be avoided, you know? I have yet to change a tyre on the Gibb River Road. I have yet to overtake another vehicle there, too. River crossings are only a problem at the beginning of the season. Luckily the water drops pretty quickly. I already said it, just because the road has been opened does not mean that you will make it across all rivers. It really depends on your car. 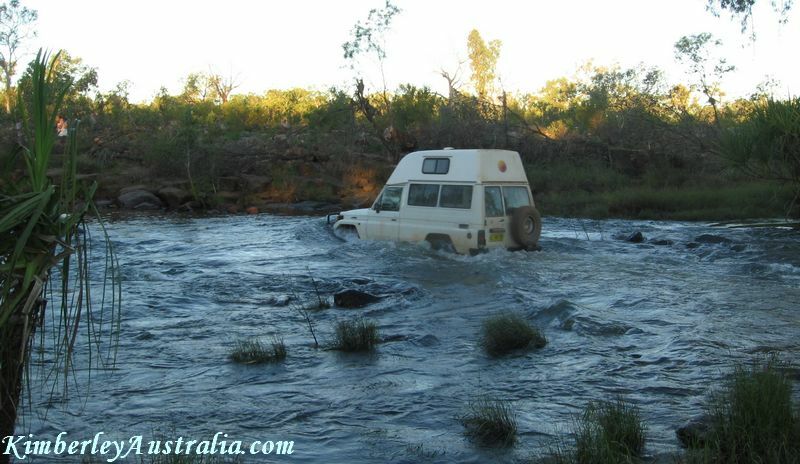 A water depth of no more than 50cm is recommended for 4x4 vehicles. A water depth of no more than 20cm is recommended for 2WD vehicles. Of course it is possible to cross water a lot deeper than that if you have the right vehicle and a snorkel, but you should know your car and you should know what you are doing. The above rules of thumb are a guideline for inexperienced drivers. So how do you actually drive across a deep crossing? Engage the four wheel drive for additional traction, select first or second gear in low range (don't change gears in the water! ), and let the car slowly make its way across. Keep the revs high enough to prevent the car from stalling. Don't feel you have to take a run up and go fast to make it. I've seen people do that and you are really asking for trouble if doing that. You're car has more than enough power to slowly and safely push its way through. Drinking water is available at a many points, too. But you should still take plenty, especially if you plan to do a bit more exploring off the beaten track. Drinking water is the one thing you can never carry too much of. It doesn't hurt to have enough to last you for a couple of days, just in case. The facilities vary. 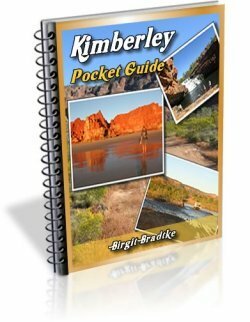 Again, all details can be found in Destination Kimberley. 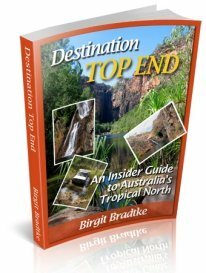 Some info is also on the page where I talk about the gorges and attractions of the Gibb River Road and of course on the page about camping along the Gibb. Some cattle stations along the Gib River Road welcome visitors and offer camping facilities, accommodation, meals and tours, but others are totally closed to the public. There are also a few resort style wilderness camps.